Plastic bags kill wildlife, clog waterways and pack landfills. Discarded bags can spread malaria if they collect rainwater, offering mosquitos a casual breeding ground. In recent years, local and national governments have begun phasing out or banning lightweight plastic shopping bags. But alternatives are not necessarily greener: People buy more plastic trash bags when shopping bags are unavailable. And a British government study found single-use paper bags contribute more toward global warming than plastic bags. For some activists, the effort to reduce the use of plastic shopping bags is both urgent and too late. According to a 2008 estimate in Waste Management, people around the world discard between 500 billion and 1 trillion plastic bags a year. The National Oceanic and Atmospheric Administration (NOAA) lists single-use plastic bags as a major contributor, along with food wrappers and fishing nets, to the Great Pacific Garbage Patch — vast, shifting waves of trash that often arrive via storm drains and rivers and can entangle marine life or be ingested. According to a 2014 estimate published in PLOS ONE, more than 5 trillion pieces of plastic (not all from bags) weighing a combined 250,000 tons are floating in the world’s oceans. Yet substitutes also offer cause for concern. A comprehensive 2011 study by the British environmental agency argued that plastic bags are greener than many alternatives. A paper bag must be used four or more times “to reduce its global warming potential to below” that of conventional plastic bags. The reason is that paper production — from the felling of trees to the emissions and effluent from paper factories — is dirty. The study found “no significant reuse of paper bags,” not even as trash-can liners. With a referendum in November 2016, California became the first state to ban single-use plastic bags, according to the National Conference on State Legislatures, which keeps an active list of American laws. Thicker, reusable bags are still available for purchase for 10 cents. Before California, cities often organized the bans: In 2016, for example, Cambridge became the first Massachusetts city to ban plastic bags altogether and require merchants to offer paper bags for a fee of no less than 10 cents. By contrast, Missouri’s legislature in 2015 forbid cities and counties in the state from enacting plastic bag bans. The European Union passed legislation in 2015 aiming to cut plastic bag use in half by 2019 and half again by 2025. E.U.-member France went further, banning single-use plastic bags on July 1, 2016, and phasing in other, more restrictive bans in the upcoming years – including the prohibition of plastic cooking utensils by 2020. Do these bans work? They do appear to reduce the number of shopping bags used, but the effect on demand for (potentially pernicious) alternatives is unknown. Five years after Ireland instituted a 15 Euro cent levy on plastic bags in 2002 – Irish stores had been giving out 1.2 billion each year for free – a paper published in Environmental and Resource Economics suggested a 90 percent reduction in use. Researchers at Cardiff University, in the United Kingdom, found that a fee for plastic bags introduced in October 2015 has led to a sharp decline in the number of shoppers who take single-use bags at checkout, from 25 percent to 7 percent after one year. China, which banned many types of plastic bags in 2008, claims some successes. But some reports suggest the rule has been difficult to enforce. 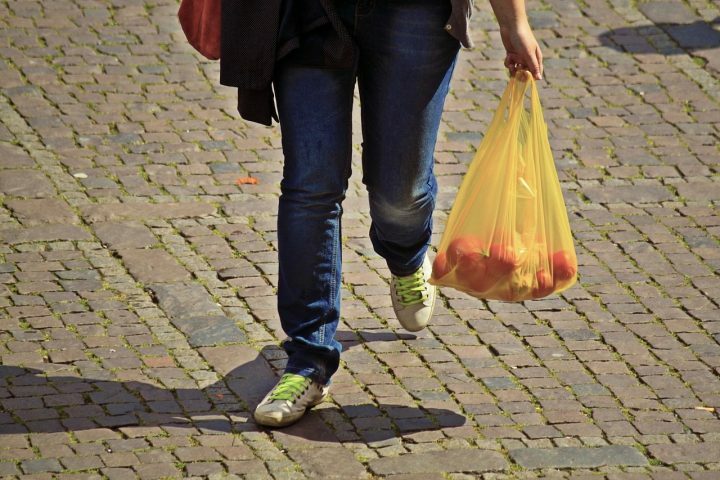 The European Union hosts an online forum to discuss biodegradable plastic bags. Researchers have looked into the policy challenges of biodegradable plastics, how they break down in the ocean and wider environmental impacts. Besides assuming a deviant place in marine ecosystems, there are concerns about the synthetic compounds in plastic that may be oozing into our food. One of the main building blocks of plastics, bisphenol A (also known as BPA), has been shown to stimulate breast cancer cells and damage the quality of rat sperm. Phthalates are another subject of disquiet. Another plastic causing concern is the microbeads found in some exfoliating facial scrubs and toothpastes, which are rinsed down drains into rivers, lakes and oceans. A 2015 study in the Marine Pollution Bulletin estimated that between 4,594 and 94,500 microplastic particles pass into the sewer during each use (between 16 and 86 metric tons annually in Britain alone). A forthcoming study in Chemosphere finds that microbeads do not accumulate in the gut when fed to goldfish, though both studies recognize their chemical effect in the food chain is unknown. In 2015, President Obama signed the Microbead-Free Waters Act to ban microbeads in hygienic products, though they continue to be used in other countries. Proponents of plastic bags argue that they are hygienic and cheap and preserve foods that would otherwise spoil. A number of lobbies have worked to confound legislation that would reduce the availability of plastic bags. In California, for example, The Washington Post found that the American Progressive Bag Alliance – a Washington-based group run by a plastics lobby – spent over $3 million in the fourth quarter of 2014 to oppose California’s attempts then to legislate a ban. Plasticfilmrecycling.org (a project of the American Chemistry Council) is supported with funds from large multinationals like Dow Chemical and ExxonMobil. Some organizations – such as the Plastics Industry Association, which directs visitors to the American Progressive Bag Alliance and bagtheban.com — support recycling as a solution, rather than less plastic. The California plastic bag ban received support from the California Grocers Association. Grocery stores stood to benefit because the law mandated they charge 10 cents for reusable bags. The American Forest and Paper Association argues for the use of paper bags and against the imposition of fees on paper bags. A website – plasticbaglaws.org – founded by a California lawyer who consults for activist organizations, has a number of useful links. This 2011 E.U. study shows, among other things, that residents of eastern E.U. members and Portugal use the most plastic bags in the union. Journalist’s Resource profiled a 2016 paper on gender stereotypes and environmentally friendly behavior that found some people think recycling is feminine. A 2015 paper in the Journal of Marketing found that people who bring reusable grocery bags on their shopping trips may purchase more junk food. NOAA has fact sheets on microplastics in the ocean and plastic marine debris.